TWO STUNNING free kicks by Ross Forbes earned Dumbarton a well-earned point away to Stenhousemuir. TWO STUNNING free kicks by Ross Forbes earned Dumbarton a well-earned point away to Stenhousemuir in front of a 462 crowd at Ochilview. After an uncertain start to the game, and wearing a Stenny away kit because of a mix-up, Sons were 1-0 down on seven minutes. The defence hesitated as Harry Paton burst through to slot the ball home low and hard to give Stenny the lead. Both sides laboured for the ensuing half hour, before Dumbarton grabbed a vital equaliser just before half time. Ross Forbes was the man who made it 1-1 in time added on, striking a superb free kick from the edge of the area high and into the top corner of the net (pictured). But it was too easy for the Warriors on 53 minutes. They broke from a Sons corner and Mark McGuigan got the final touch on the end of a swift move to make it 2-1 to the home side. Dumbarton pushed back hard, attacking with pace and energy, winning a series of corners and twice coming close to getting a goal back. 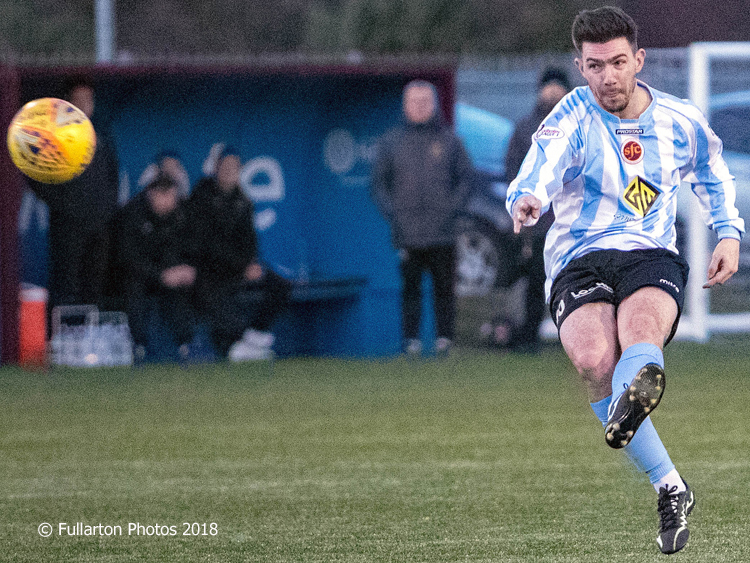 Despite Stenhousemuir coming into it again in the closing stages, Sons maintained their pressure. Right at the end they were rewarded with another amazing free kick from Ross Forbes to secure a deserved 2-2 equaliser, after the Warriors went down to ten men. Conor McBrearty was the man receiving a second yellow card.